ROME (CNS) — Surrounded by survivors of innocent people killed by the Mafia, Pope Francis made an emotional appeal to Italian gangsters to give up their lives of crime and avoid eternal damnation. 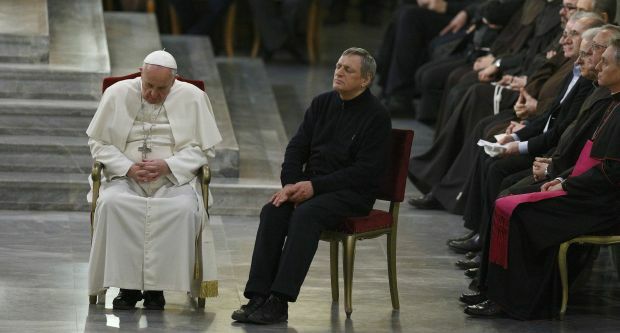 “Men and women of the Mafia, please change your lives, convert, stop doing evil,” the pope said at a prayer vigil March 21. “I ask on my knees and for your own good. Every year since 1996, the Italian anti-Mafia group Libera has observed March 21, the first full day of spring, in memory of innocent victims of organized crime. According to the group, the approximately 700 people gathered with Pope Francis in a Rome church this year represented the families of an estimated 15,000 such victims across Italy. In his greeting, Father Luigi Ciotti, founder of Libera, denounced the Mafia as the “assassin of hope” and recalled a range of its victims. The priest mentioned women caught up in human trafficking, people fallen ill owing to illegal disposal of toxic waste and even children, including Domenico Gabriele, an 11-year-old shot to death while playing soccer in 2009, and Nicola Campolongo, a 3-year old murdered in January, reportedly to avenge an unpaid drug debt.